While lacking in milk and butter, these mashed potatoes are certainly not lacking in flavor. You may enjoy this comfort food with peace and comfort. Roasted Garlic provides a creamy, mildly sweet, garlicy flavor that perfectly replaces traditionally used butter. 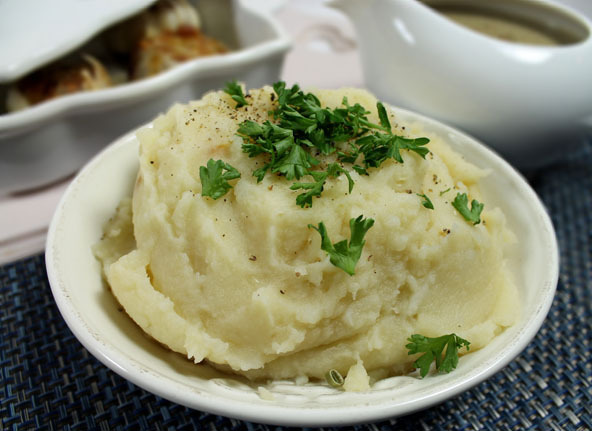 These mashed potatoes pair up nicely with my non-dairy, vegan Creamy Onion Mushroom Gravy. Sooo good. 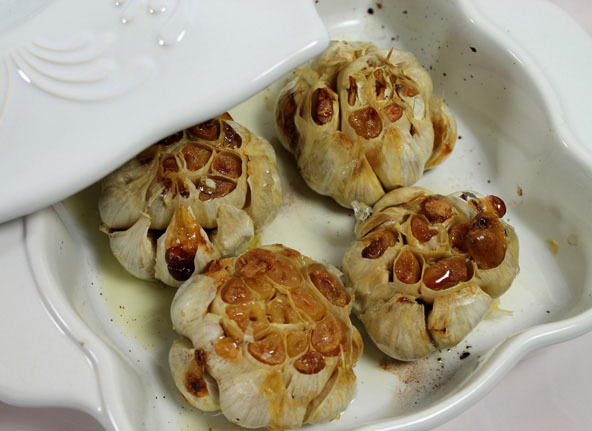 Plan 30-40 minutes a head of time to bake the garlic and then let cool for 10-15 minutes so you can squeeze the soft roasted garlic out without burning your hands. Cut off the end of garlic bulb and drizzle olive oil on top. Place in a baking dish with a lid and bake at 400 degrees for 30 to 40 minutes. Put a pot of water on the stove to boil the potatoes in. Use just enough water to barely cover the potatoes. Peel potatoes with a vegetable peeler or keep the skins on for its nutrients especially if you are using organic potatoes. Cut potatoes in about 2"-3" pieces (keeping them all the same size) and place into the boiling water. Cook the potatoes until just tender by checking with a fork after about 15-20 minutes of boiling. Squeeze the cooled roasted garlic from the bulb and add to the potatoes along with the olive oil. Mash potatoes and garlic together with a potato masher. For extra creamy potatoes consider using a ricer. Slowly add the broth a little at a time to the potatoes until the right consistency is achieved. Steam Cauliflower and mash together with the rest of the ingredients. Cauliflower is an excellent addition to this recipe as it provides superior nutrition without starchy dense calories. 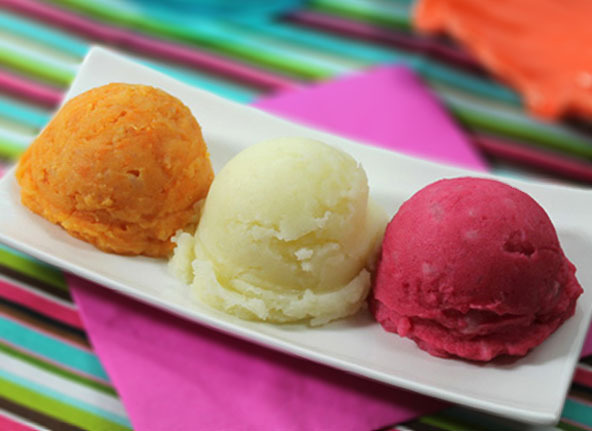 See Pizzaz Potatoes recipe for colored variations.